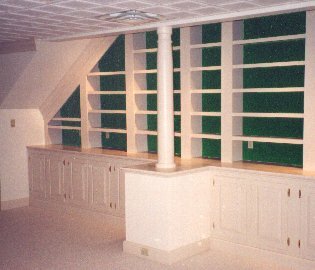 Now's the time to put that basement space to better use! More and more people are building home theatres in the basement. They're a great place to watch big-screen movies and sports events, and they're a great place for the kids to entertain their friends safely and economically. Don can create a theatre-style room with appropriate dimmable lighting, and can even provide all the theatre fittings: projection, sound, screen, and seating. When it's not in use as a theatre, the room is a great location for playing video games, or even ping-pong! A small kitchenette is a nice basement feature, with a refrigerator for beverages, a microwave, even a popcorn popper. A kitchenette goes well with a home theatre, too. Got kids' toys knee-deep in your living room? Talk to Gilmore Construction about adding a family room for the kids. They can have their own space for toys and play, maybe even their own powder room. If you have an older child living at home, consider adding a bedroom and bath in the basement for more privacy. Does your basement have an outside door? According to Don Gilmore, an egress door or window is often required by current building codes. And they provide more light and a feeling of openness in the basement.